Linker scripts control the linking process. Their main function is to tell the linker where memory can be found in the target system, how much there is and its type. 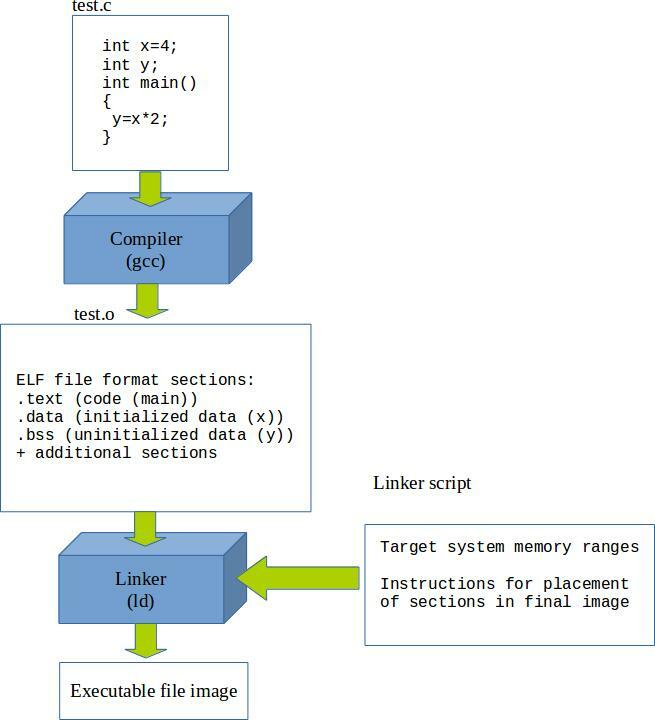 The linker script file is also used to label different sections of memory for different purposes. The MEMORY part of this script states that Flash ROM starts at address 0x08000000 and that there is 64k available. It also states that RAM starts at address 0x20000000 and that there is 8k available. The next part of the script labels and organises the different sections of memory. 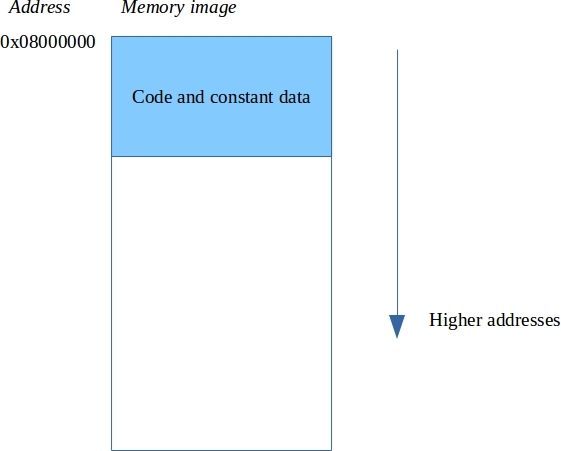 Think of this as a blueprint for creating a memory image of the program. A particular syntax is used here. A single dot is used to identify the current location (in much the same was as ‘.’ is used to represent the current directory in various OS’s). 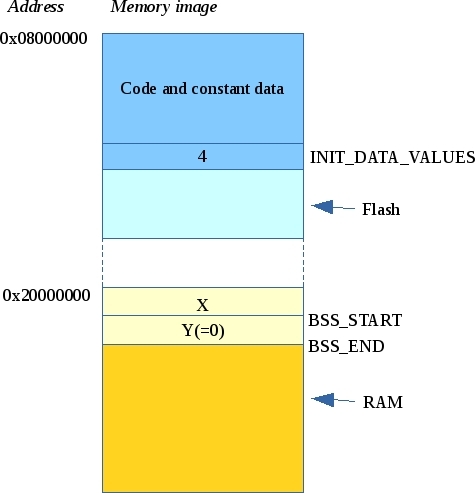 moves the linker’s memory image pointer (usually called the location counter) to the start of the flash memory region (0x080000000) in this case. The linker will sequentially output the sections that follow to this point forwards until a new origin statement is met. The .text section is output here. It contains all allocations that the compiler marks as belonging to the .text section. These typically consist of executable code and constant data definitions. 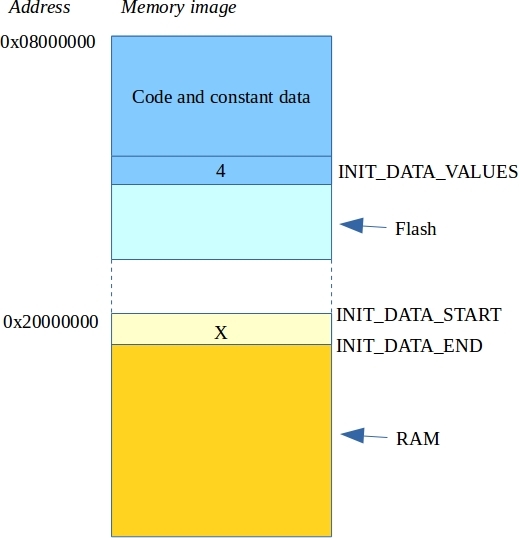 INIT_DATA_END which marks the end of the data in RAM. The last section of the linker script file (Line 20 onwards) deals with global and static variables that are not explicitly initialized. The normal practice here is to zero out these variables. The compiler marks these symbols with as belonging to the “.bss” section (see Wikipedia for origin of the term). The linker script marks the beginning and end of the bss variables with a BSS_START and a BSS_END symbol. Our memory image now looks like this. Reference: RedHat guide to linker scripts. Thanks for this article. I think “M0” should be changed to “M4″(both in the article and the code).